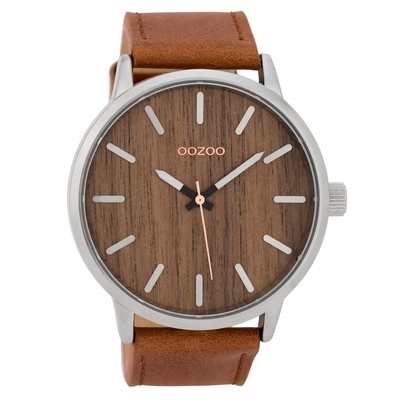 OOZOO Timepieces C9255 gents watch XL with silver metallic frame, wooden dial and cognac leather strap. 3 Atm - Suitable for washing hands. Unsuitable for Bath, Swimming and Diving. OOZOO Timepieces C9255 gents watch XL with silver metallic frame, wooden dial and cognac leather strap. This watch belongs to Winter 2019 OOZOO Timepieces Collection.